uses real-life examples of hazards and disasters to explore how and why they happen and what we can do to limit their effects. The text's up-to-date coverage of recent disasters brings a fresh perspective to the material. Focus on globalization of our economy, information access, and human effects on our planet in a broader, more balanced approach to the study of natural hazards. Students work through 11 different assignments by stepping into the role of a practicing geologist and analyzing potential disasters in the fictional town of Hazard City. Newly revised stories and case studies give students a behind the scenes glimpse into the lives of survivors, professionals and hazardous events. The new chapter structure and design organizes the material into three major sections to help students learn, digest, and review learning objectives. 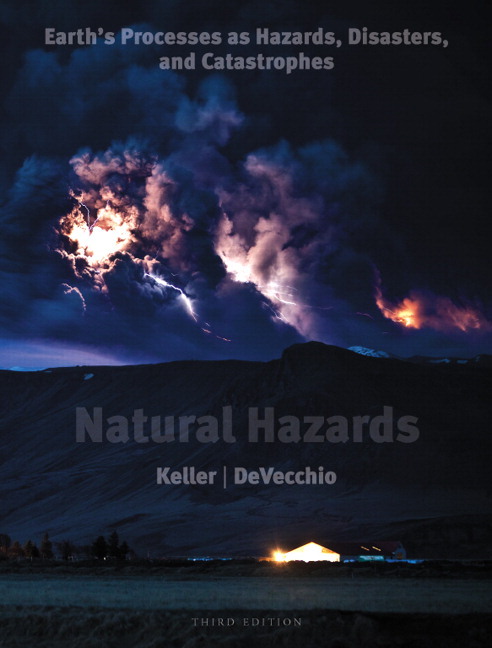 Five Fundamental Concepts for Understanding Natural Processes as Hazards – Chapter 1 introduces five concepts that unify the diverse topics the student will by studying: Predictability of Hazards; Risk Analysis; Links between Hazards; Progression of Hazards from Disasters to Catastrophes; and Minimizing Consequences of Hazards. To make these connections even more clear, at the end of each chapter, the chapter's topic is summarized in terms of these concepts. Critical-thinking questions that stimulate students to think about some of the important issues in the text and relate these to their lives and society. Survivor Stories feature interviews with people who have experienced hazards first-hand. Professional Stories feature interviews with professionals working in the field of natural hazards that focus on their experiences and their recommendations to students. Case Studies explore in-depth profiles of significant hazardous events. NEW CHAPTER! The Internal Structure of Earth and Plate Tectonics. This chapter focuses on the theory of Plate Tectonics and the relationship of this theory to hazards and human population. NEW! Revisiting the Fundamental Concepts remind students of the unifying theme of the “Five Fundamental Concepts” introduced in the first chapter, identifying how each particular hazard relates to the five fundamental concepts. NEW! A Closer Look uses real-life events and data to enhance the understanding and comprehension of not only the hazard, but also the mitigation that coincides with the hazard. NEW! Did You Learn? featureat the end of each chapter gives students the ability to track their comprehension of the learning goals stated at the beginning of each chapter. Coverage of the most recent disasters on Earth is provided, such as the earthquakes in Haiti, China, Italy, and Chile; 2010 Icelandic volcanic eruptions; 2010 debris flows in California; 2010 severe winter weather; and more. Revised design throughout the book includes dramatic changes to the chapter openers, which feature all new photos and content. Updated art program showcases new figures, illustrations, and photos throughout. Each image has been reviewed for accuracy and relevance, focusing on its educational impact. Hazard City: Assignments in Applied Geology, Fourth Edition is now available online and an access code is included with every text. Hazard City gives instructors meaningful, easy-to-assign, and easy-to-grade assignments. Students work through 11 different assignments by stepping into the role of a practicing geologist and analyzing potential disasters in the fictional town of Hazard City. New multiple choice assessment items have been added that challenge students to apply the concepts beyond the core set of scenarios provided. — Assessment Questions: New assignable, assessable, multiple-choice questions have been added to each Hazard City assignment. The questions will focus on the higher-level thinking qualities of application and synthesis based on student interactions with the specific assignments. — Thoroughly class tested: All activities have been refined through testing in both the traditional and online classroom. — Substantial, critical thinking assignments: Each activity takes 30-90 minutes. The activities require students to gather and analyze real data, participate in real issues, encounter uncertainty, and make decisions. — Student flexibility for submitting answers: The website includes downloadable worksheets that students can submit to the instructor. The website also includes assignable multiple-choice questions, that can be computer graded and feed to a course gradebook. o Map Reading: Builds map-reading skills and gives students the confidence they need to solve map-based problems in later assignments. o Ground Water Contamination: Students use field and laboratory data to prepare a contour map of the water table, determine the direction of ground water flow and map a contaminated area. o Volcanic Hazard Assessment: Researching volcanic hazards, collecting field information, and decision-making are all used to determine the potential impact of a volcanic eruption on different parts of Hazard City. o Landslide Hazard Assessment: Students research the factors that determine landslide hazard at five construction sites and make recommendations for development. o Earthquake Damage Assessment: Students research the effects of earthquakes on buildings, explore Hazard City, and determine the number of people needing emergency housing given an earthquake of specific intensity. o Flood Insurance Rate Maps: Flood insurance premiums are estimated using a flood insurance rate map, insurance tables and site characteristics. o Snowpack Monitoring: Students utilize climatic data to estimate variables that are key to flood control and water supply management. o Coal Property Evaluation: The potential value of a mineral property is estimated by learning about mining and property evaluation then applying that knowledge in a resource calculation. o Landfill Siting: Students use maps and geological data to determine if any of five proposed sites meet the requirements of the State Administrative Code for landfill siting. o Shoreline Property Assessment: Students visit four related water-front building sites—some developed and some not—and analyze the risk each faces due to shoreline erosion processes. is a professor, researcher, writer, and most importantly, mentor and teacher to undergraduate and graduate students. Currently, Dr. Keller's students are working on earthquake hazards, how waves of sediment move through a river system following disturbance, and geologic controld on habitat to endangered southern steelhead trout. He was born and raised in California (Bachelorâ¿¿s degree in Geology and Mathematics from California State University at Fresno, Masterâ¿¿s degree in Geology from University of California at Davis), it was while pursuing his Ph.D. in Geology from Purdue University in 1973 that Ed wrote the first edition of Environmental Geology, the text that became the foundation of the environmental geology curriculum. Ed joined the faculty of the University of California Santa Barbara in 1976 and has been there since, serving multiple times as the chair of both the Environmental Studies and Hydrologic Science programs. In that time he has been the author on over 100 articles, including seminal works on fluvial processes and tectonic geomorphology. Edâ¿¿s academic honors include the Don J. Easterbrook Distinguished Scientist Award, Geological Society of America (2004), Quatercentenary Fellowship from Cambridge University, England (2000), two Outstanding Alumnus Awards from Purdue University (1994, 1996), A Distinguished Alumnus Award from California State University at Fresno (1998), the Outstanding Outreach Award from Southern California Earthquake Center (1999). is currently a researcher and adjunct professor at the University of California, Santa Barbara, where he earned his PhD in geology. Since starting his graduate education, Duane has devoted a significant amount of time to becoming an effective communicator of science to todayâ¿¿s students. He is a passionate teacher and feels strongly that students need to develop the ability to critically evaluate data presented in numerous forms from various sources. He believes this is particularly important in todayâ¿¿s world where the internet offers accessibility to vast amounts of information, yet the validity of this information is often questionable or misleading. Fundamental to teaching this skill is integrating data from his current and past research to illustrate to students the methodology and rigor of scientific investigations. Duane has a broad field-based background in the Earth sciences and likes to tell stories about his many months of living in trailers in the middle of nowhere mapping rocks. For his Masters Degree and post-Masters research he conducted structural and stratigraphic analysis, as well as numerical dating of volcanic and volcaniclastic rocks in southeast Idaho and the central Mojave Desert of California, which record the Miocene depositional and extensional histories of these regions. His PhD research was aimed at resolving fault slip rates and quantifying the earthquake hazard presented by several active fault-related folds growing beneath urbanized southern California. Duaneâ¿¿s current research interests focus on the timing and rates of change of Earthâ¿¿s surface due to depositional and erosional processes that result from climate change and tectonics. When Duane is not teaching or conducting research, he enjoys whitewater rafting, rock climbing, snowboarding, and camping with his partner, Christy.